Pecha Kucha – means ‘chit chat’ in Japanese. 20 images with 20 seconds to talk on each image. Clive Hall – 12th June 2012 – I was speaker number two, (so was able to enjoy the nine others). A very interesting and entertaining evening with subjects on absolutely anything! I talked on Tengenenge – the stone sculpture story. Just over a month ago, Bruce and I travelled to Guruve, about three hours north east of Harare. 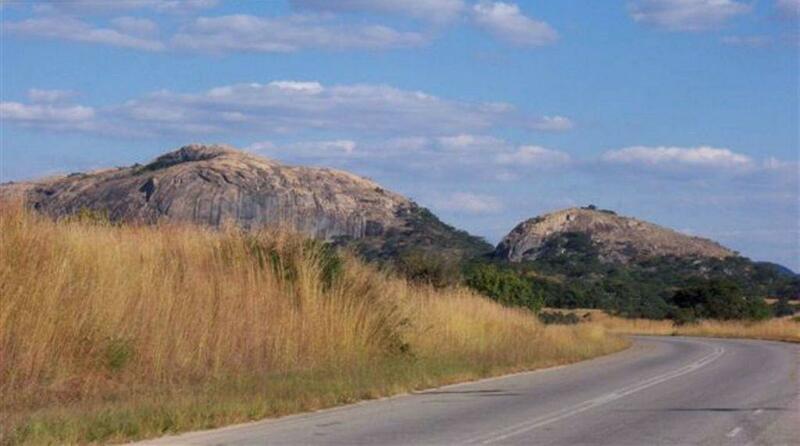 This image is of Zomba Parta – a granite rock mass and place of spiritual ancestors which is part of a very beautiful drive in the fertile ex-commercial farming district of Central Mashonaland, and home to where we used to farm in the Mazowe District. Always an emotional and sentimental journey and still as geographically wonderful as ever. At this splendid sign we turn right down a rough road and track for 18kms to the Tengenenge Sculptor and Art Community which is at the base of the Great Dyke range of hills in some very beautiful and scenic countryside. It does take you through a worrying scar on the landscape – a large chrome mine being developed by the Chinese with very little respect for the people or the environment. 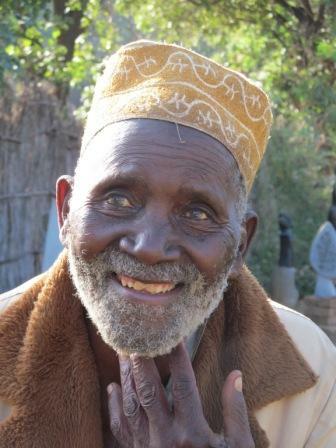 Tengenenge which means ‘the Beginning of the Beginning’ is a community of people that have come about mostly as the result of this man, the late Tom Blomefield who was amongst many other things a tobacco farmer who farmed Tengenenge Farm in the 1950’s. Employing a largely migrant labour force, the evenings were long, and it was through the children who were being taught at a local school by a catholic priest to carve from the local stone, that the parents started to join them creating pieces of work from stone. Tom recognised the art form as being a creative channel for their sense of identity and history and encouraged them and took greater interest in their work, so beginning one of Africa’s most impressive art forms. He later donated his farm to the community. 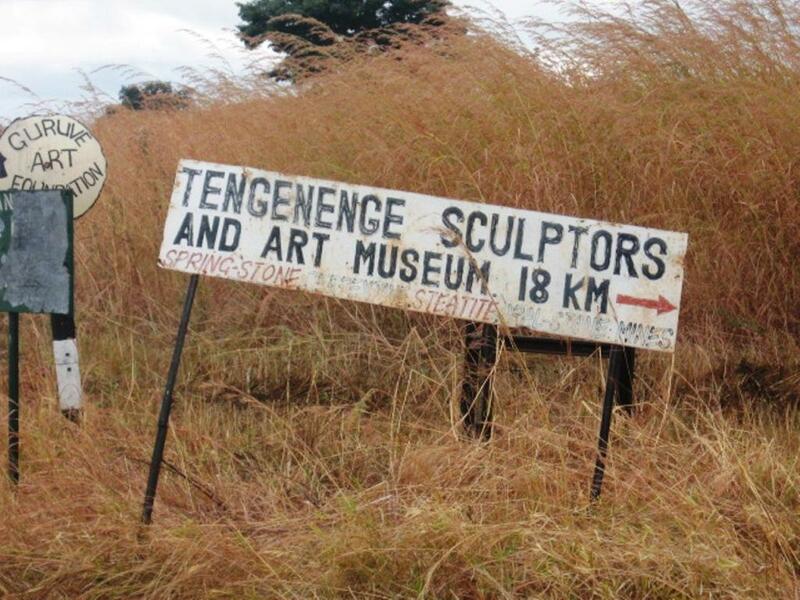 Today, almost sixty years later Tengenenge is home to more than a hundred artists and their families who use the local stone, mainly serpentine and springstone to carve their pieces. The artists live and work under the beautiful msasa trees, with each artist allocated a small plot to proudly display their work. This is truly a special and very spiritual place where the sculptors find inspiration for their pieces that often represent family values, children, play, animals and love. It is highly organised and hosts international wholesale buyers, such as ourselves, from all over the world. Very few, if any tourists, venture this far into the rural areas. 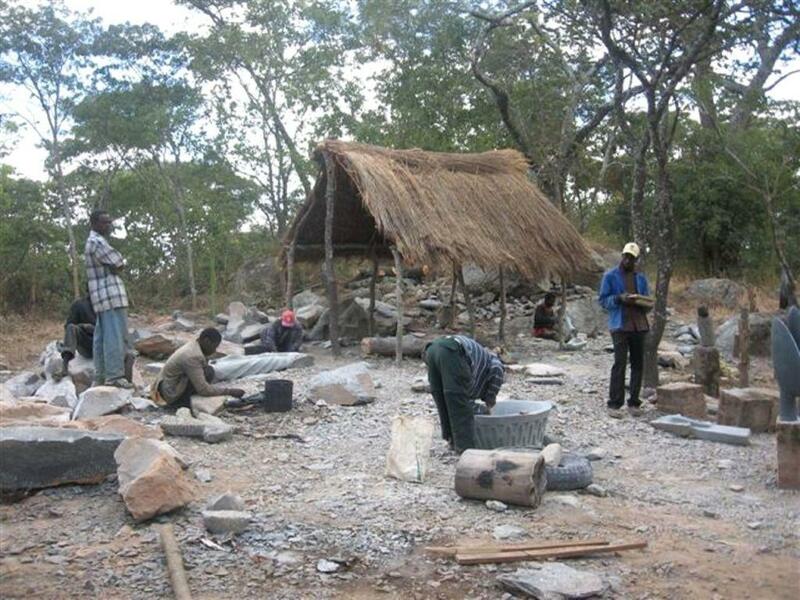 There is no electricity here and the pieces are made from several different types of stone which are mined locally in the surrounding hills. Plenty of time, patience and hard physical work allow them to hue their pieces from very large to very small pieces of rock. Some pieces taking weeks to make. The process is completed with many hours of sand papering, heating and waxing the sculptures to attain the highly polished finish that is so attractive. The huge choice of work available makes the selection process long, tiring but most rewarding for us. The artists say they allow the spirits within the stone to guide them in their carving, with many of them becoming specialists in their own fields – such as the Owl Specialist or Hippo Specialist. Amali Malola is 98 years old originating from Malawi as a migrant worker in the early 1950’s. 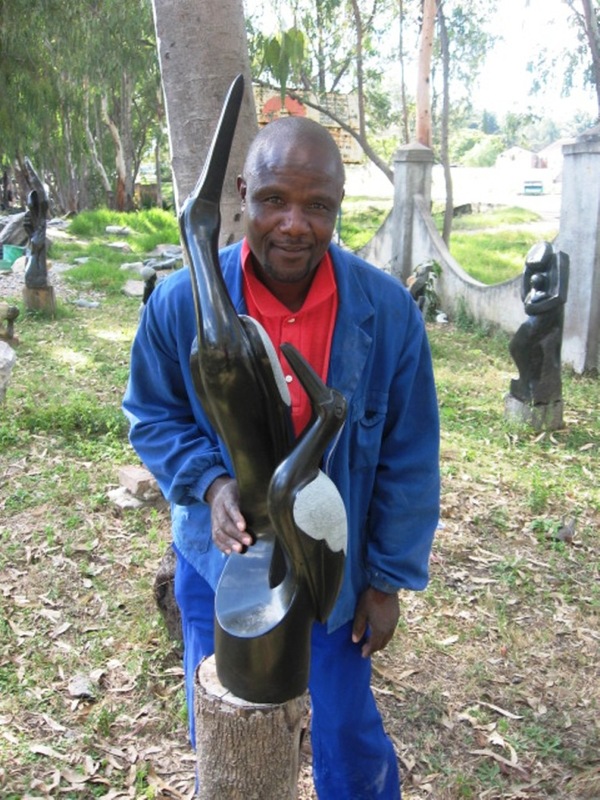 He is one of the few remaining first generation sculptors still working today. A wonderful man with a good heart and a great face. A photo I am proud of, which was taken on this trip. 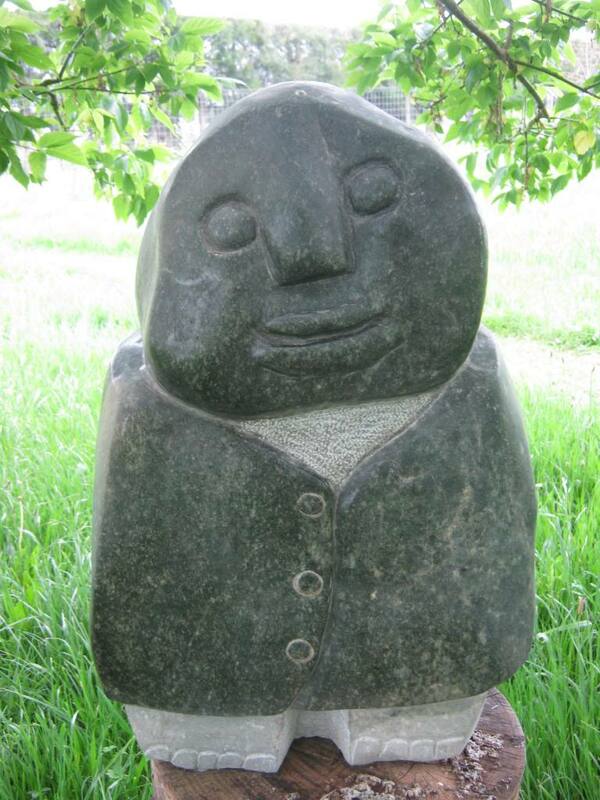 Amali Man – one of our favourite pieces carved when Mr Malola was 96 and one we intended to keep in our collectors garden, however, a Nelson couple recently fell in love with this piece and intuitively knew that it was a special one and so we were happy to part with it. This piece has the naive appeal of many of the first generation pieces. The styles have evolved and developed over the last 60 years to more sophisticated and contemporary designs. The opposite end of the generations is young William Gunja (great name) whom we were very proud to be his first customer. William is five years old and is learning the skills from his father and grandfather as he wants to follow in their footsteps – we will try and buy something from him each year to keep encouraging him. 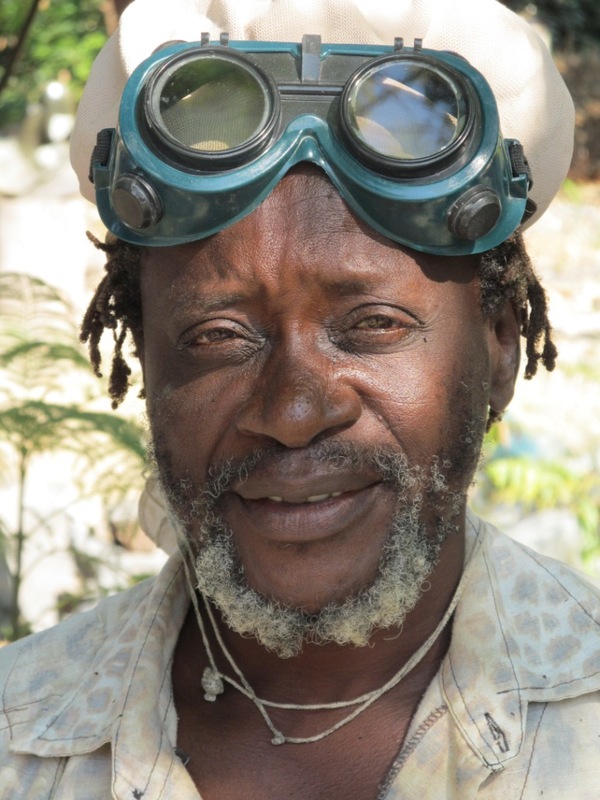 Dominic Benhura – a legend in Zimbabwe and claimed to be in the top five sculptors in the world. Dominic is Director of the Tengenenge Trust and fosters and promotes their work internationally. He is extremely successful in his own right and regularly holds one-man shows around the world and is particularly well known and respected in Europe and America. He sponsors and entirely funds more than 15 sculptors within his own studio and is a most likeable and modest family man. This Brahman Bull is one of his recent newer styles of work, a large piece commissioned for a rancher in Texas with a six figure price tag. 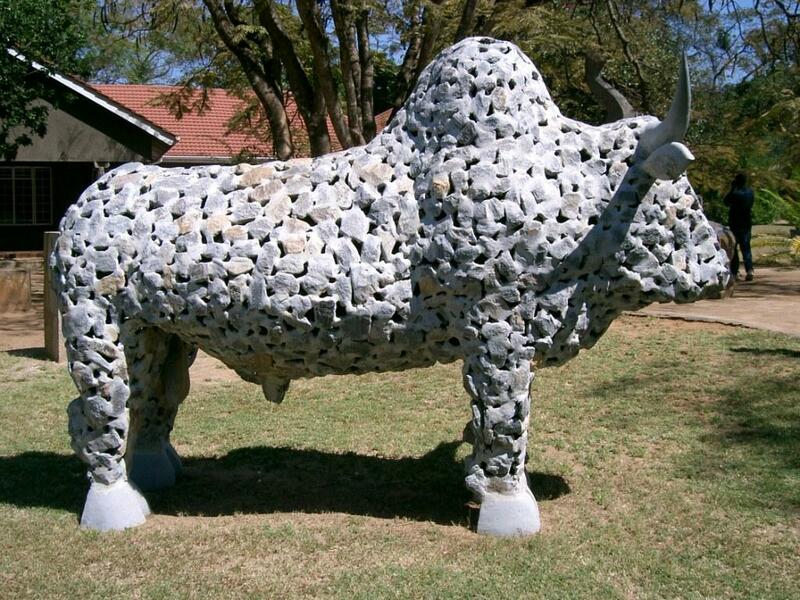 This one unusually made of small pieces of stone, with others made using animal bone. His work generally reflects his love of children playing, women and animals, the sizes only dictated by the length of a 40′ container! One of his pieces graces the outside of the UN Building in The Hague. Stanford Derere – a great friend and colleague of Dominic’s who works within his studio, and slightly more affordable. This was him taken last month whilst at work – another photo I am proud of. 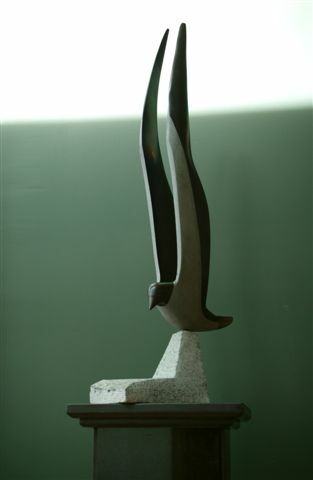 Stanford is famous for his bird and flight forms to which we have been fortunate enough to have sold several pieces over the last few years, however, his work is gaining in value and is highly collectable so not sure how many more we can afford! 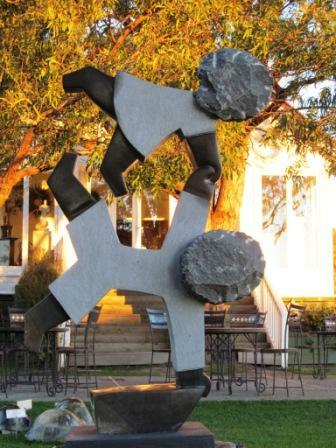 This piece was one of our earlier purchases and exhibited at Sileni Estate Winery. It now graces a lovely home in Hastings. We hope to hold several exhibitions of stone away from Hawkes Bay with our eyes set on Auckland, Sydney and one in Virginia, USA next September. 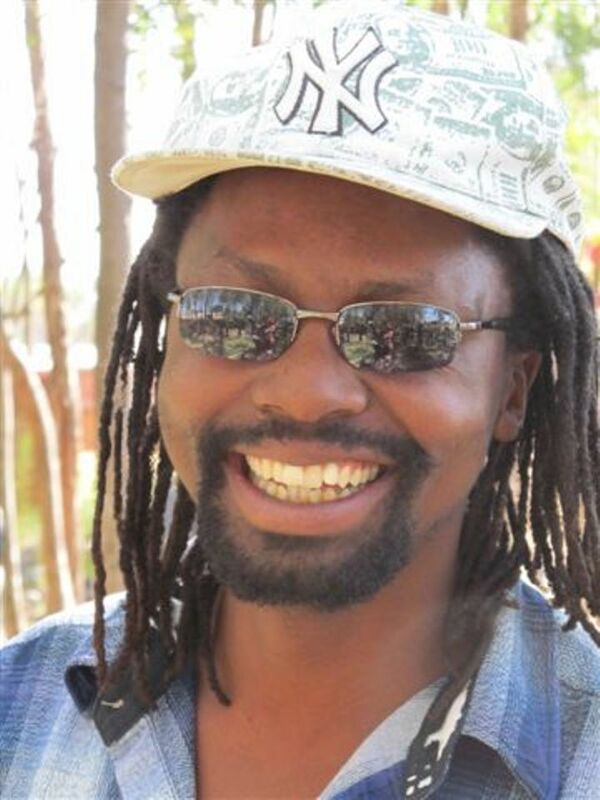 Washington Matafai – another very successful young artist who no longer works at Tengenenge but in a high density areas just out of Harare. We visited him during the cholera epidemic a couple of years ago and were somewhat shocked by the surrounds he was working in. How he creates these amazing organic shapes and designs that take your breath away – I will never know. His working conditions are hardly conducive to creativity. 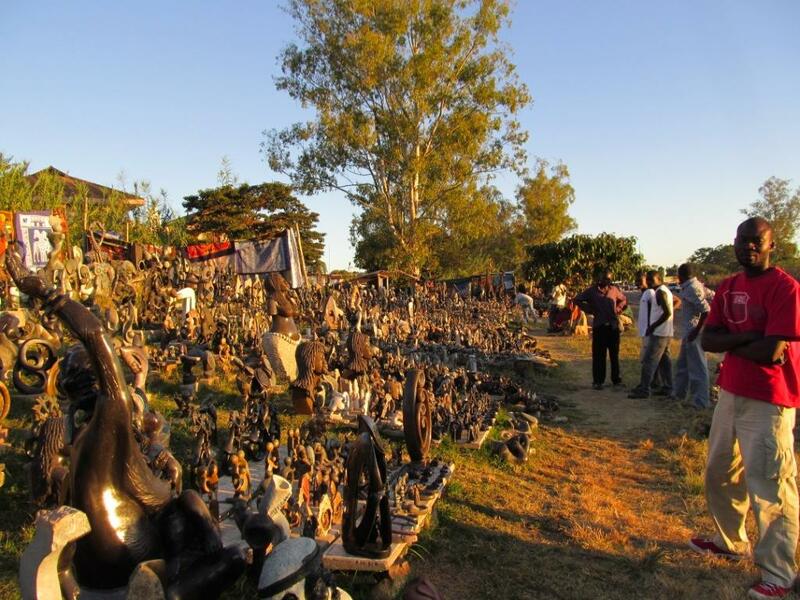 The market sellers in Harare often sell the smallest pieces on behalf of stone sculptors, often known as ‘airport art’ these are cheap and popular reproductions of stone which are sold to whoever they can persuade to buy them – and believe me, they are persistent! This is an exhausting experience as the desperation of their lives still so evident, however, very colourful and stimulating even though they all sell much the same craft as each other! It is a case for hunting for the treasure items of which there are still a few to be found. 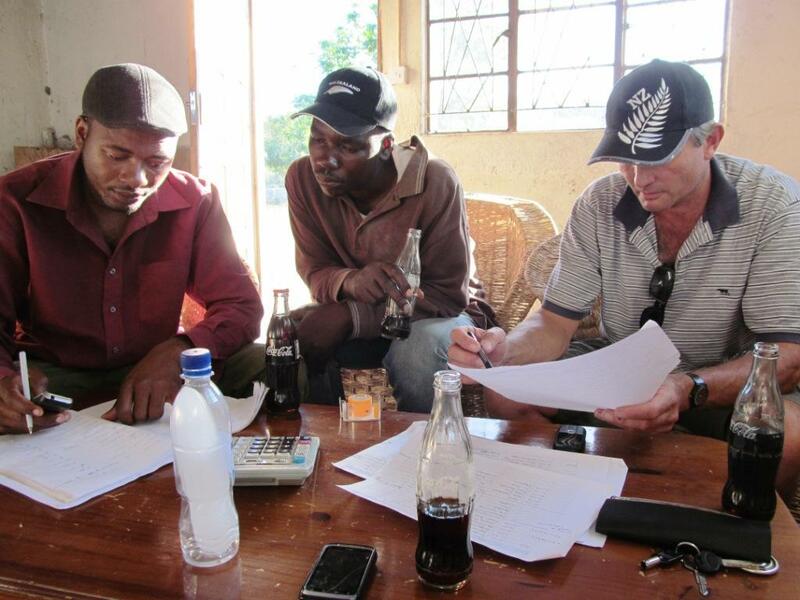 Here is Bruce, Tendayi and Blessing at the end of the community stone sculpture selection process totting up our purchases. These guys are truly a pleasure to work with, we maintain contact with them throughout the year on dodgy email connections, we assist their community efforts where we can and we keep them up to date with our marketing and sales plans, as they do us with theirs. I only drink one coke a year – after a long hot tiring day selecting stone and it is the best drink of the year! 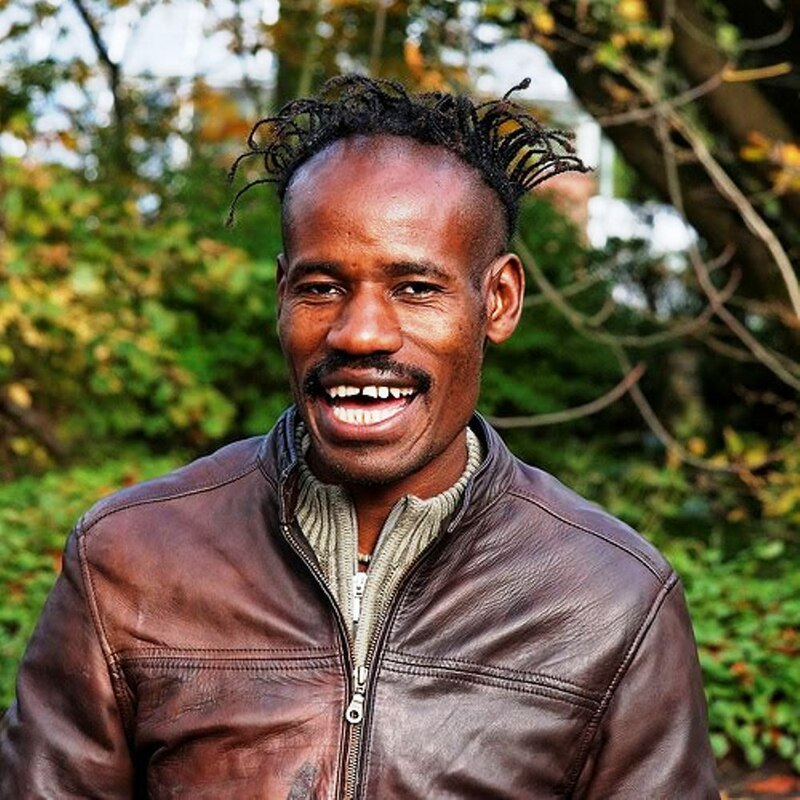 Jasper Mukuni is a Tengenenge artist moved to the city, and a city boy he is! Third generation sculptor and very aware of the market trends and highly adaptable to customer requests and design. A very smooth and professional operator, well travelled having been a workshop guest in H olland, Germany and America and keen to come to New Zealand! A new leader in the stone sculpture movement driven by making a name and money! 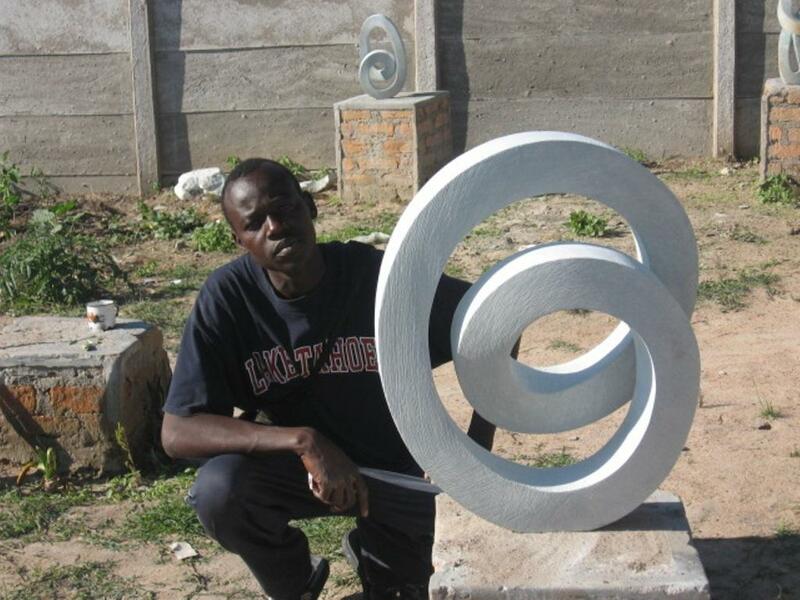 This is one of our favourite artists – Stephen Chikeya, a wonderfully modest man completely passionate about stone and sculpting. I asked him who was the most famous person he had sold a piece to – a personal buyer for Sir Terence Conran in London, one of Britain’s most respected designers. 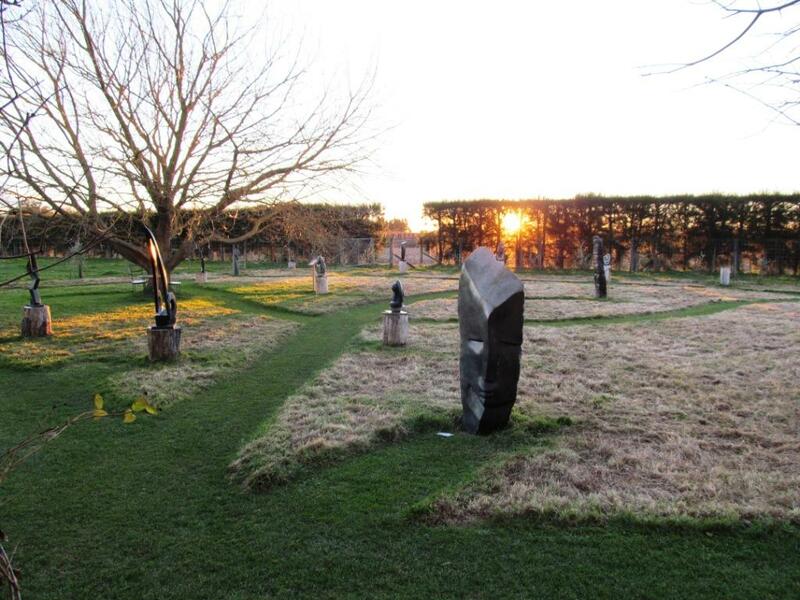 Back to New Zealand and our garden where we are lucky to have two of Dominic’s pieces – this photo taken recently on a lovely winters evening. We bring one container back each year and our garden grows with ever extending sculpture walks. We have become addicted – along with many of our customers! 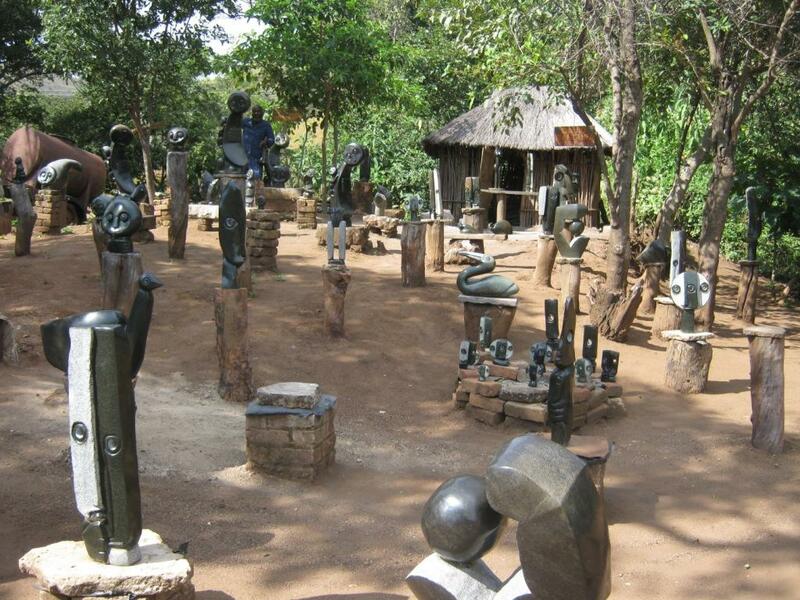 This photo is of the sculpture garden in winter mode – not too many of them left as we have had a very good summer season, however, new ones that we have recently purchased from the communities in Zimbabwe are on their way. We feel most privileged to represent this art form in New Zealand, as we were not entirely appreciative of it whilst we lived in Zimbabwe. It has taken a new beginning to have discovered this. Finally, a recent photograph of the Birdwoods Gallery and Sweet Shop – when you visit, we can assure you that you will have more than 20 seconds viewing per sculpture! If you are still not sure what Pecha Kucha is – have a look online. This entry was posted on Thursday, June 28th, 2012 at 2:53 pm	and posted in Birdwoods News, Birdwoods Sculpture. You can follow any responses to this entry through the RSS 2.0 feed. « In memory of Gail Hansen…..